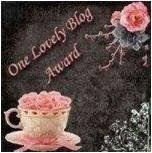 Thanks to Silver Moss Jewellery my blog is now officially lovely! The Silver Moss range of jewellery is gorgeous with echoes of natural forms and hints of colour created using sterling silver, glass and gemstones. Thank you for accepting the award! Am lookin forward to exploring those blogs you've listed now . . . !